"Xivu Arath, knight morph of Xi Ro. You love to conquer, don’t you? We love to see you work. Nearly two percent of Fundament’s surface is now our dominion. Your species embraces the worm. [...] Overwhelm the Kaharn bastion. Slaughter everyone there. From your acts we shall obtain the logic we require to cut space open and migrate to orbit. Reality is a fine flesh, oh general ours. Let us feast of it." Xivu Arath, God of War, formerly known as Xi Ro, is a Hive Knight and youngest sister to Savathûn, the Witch-Queen and Oryx, the Taken King. Together with her two siblings, she was a progenitor of the contemporary Hive species and one of its chief gods, having made a pact with the Worms of Fundament. She is driven to become the mightiest warrior in the universe. After the Hive's conquest of the Harmony, Xivu Arath and her Hive left her siblings for deep space, claiming Oryx had grown too powerful for her to accept. "I am Xi Ro, youngest daughter of the dead king. I will take back my Osmium Court and kill the traitor Taox. On my left eye I swear vengeance." Xivu Arath was born Xi Ro on the gas giant Fundament with her sisters Aurash and Sathona; her father was the Osmium King, ruler of the Osmium Court. She was a member of a short-lived, proto-Hive species called "krill" whose original homeworld had crashed into the gas giant millions of years ago. As a young "krill" she was fascinated by her surroundings, attempting daring feats that would have killed lesser beings; she took six of the stormjoys' bait-stars because of this. Above all she wanted to be a warrior, a Knight like her father's warriors. When her father became mad and raved about the Syzygy, and the Helium Drinkers invaded at the urging of Taox, Xi Ro used her bait-stars to help her sisters escape and comforted Aurash as they fled their home. Together with her sisters she swore a blood-oath on the mast of their ship, upon her left eye, to avenge their father and kill Taox. When they salvaged an ancient, high-tech ship from the Shvubi Maelstrom, Xi Ro wanted to sell it to raise an army and kill Taox immediately, but was convinced by Sathona that it was worthless. During their aimless journey at the behest of Sathona (who was guided by their father's worm-familiar) Xi Ro cleaned up the ship and attempted to take her sisters' minds off their task. Eventually, when Sathona fretted they would not be able to avenge their father, and Aurash concluded they would have to dive, Xi Ro was initially afraid but understood. Xi Ro warned them, however, that this was how the crew had died, but Sathona, urged on by the Worm, agreed with Aurash. The sisters took the needle into the deep. They finally reached a point where they could use the ship's sensors on the oceans. To their horror, they discovered that the Syzygy was real, and that Fundament's moons had already aligned. Just then, they were encountered by the Leviathan, a creature long spoken of in proto-Hive myth. The Leviathan warned the sisters that they needed to turn back, or else would unleash disaster upon the universe, saying that they faced a choice between the Light, which offered civilization, and the Darkness, which offered only violence. However, the Leviathan offered no hope to the sisters to avoid the Syzygy. Sathona then revealed the Worm's help to her sisters, and how it urged them to go down. Rejecting the Leviathan's entreaties, the sisters dove into the core. "We have marooned Oryx within the Deep. This is our obligation as lords of the Hive, to make war upon each other, to eradicate weakness and make ourselves sharp." As Auryx and his sisters forced an ultimatum on the remaining proto-Hive to accept the worms or perish, Auryx turned his attention to Fundament's moons, and the Ammonites there who had allied with the Traveler and gave asylum to Taox. Initially he was willing to negotiate with the Ammonites, but his sister Savathûn, under pressure from the Worms, killed Auryx as punishment. Rather than dying, Auryx's soul instead passed to his Ascendant realm, or throne world, where his soul resided until he returned to the mortal realm. Rebuked, Auryx purged what sympathy and goodwill he had left, becoming a merciless tyrant. He and his sisters warred with and killed one another on a regular basis after the defeat of the Ammonites, as part of their worship of the Sword-Logic and their attempt to become the sharpest blades in the universe, heading to their Ascendant realms when defeated. Their war of revenge against Taox had transformed into a campaign of genocide, when they slew the Ammonites and other interstellar civilizations to feed their worms. 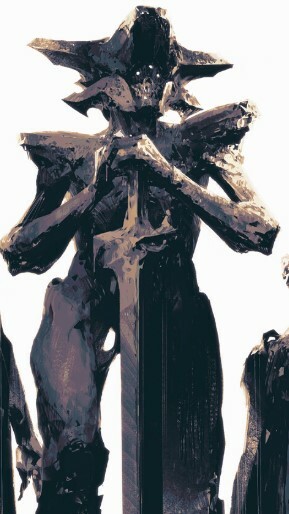 While Oryx and Savathûn established courts to practice and study the sword logic, Xivu Arath declined, declaring that her court would be everywhere war was found. Following the Golden Amputation, Oryx declared to his sisters that the Hive had conquered its way to the edge of the Deep, and that it had granted him a personal audience. As Oryx retreated into his throne world to commune with it, Savathûn conspired with Xivu Arath to strand him there and steal his Tablets of Ruin by cutting off the tribute flowing through his tithe system. They were ultimately unsuccessful. On returning, Oryx deceived Xivu Arath and poisoned her own flow of tribute so that she could never try to steal his Tablets again. Following the war with the Harmony, Savathûn decided that her fleets would enter the black hole that the Harmony lived around, claiming that they would become stronger for it, while Xivu Arath took her fleets away from Oryx's as she felt he constrained her too much. 2 years later, following the Red War, Xivu Arath began committing forces to the Solar System. An Ogre, Megor, Spawn of Xivu, was imprisoned in the Prison of Elders and broke free during the Scorn's jailbreak. A substantial force of Hive and Taken apparently obedient to Xivu Arath also invaded the Dreaming City after its unsealing, pillaging it for Awoken relics towards an unknown purpose. These forces were destroyed by The Guardian. Forsaken has the first enemies that appear relating to Xivu Arath within the Destiny series. Umun'arath, Evocate-General and Primus of All Legions of the Cabal Empire, shares part of her name with that of Xivu Arath; notably, Umun'arath is also known to use a signature phrase, "this war is all there is" associated with the Darkness. Given Umun'arath's role as a primary military leader of the Cabal, she may have some connection to the Hive God of War. Xivu Arath is the second confirmed female knight. The first is Mengoor. However, Xivu Arath could be considered the first of the Hive Knights.